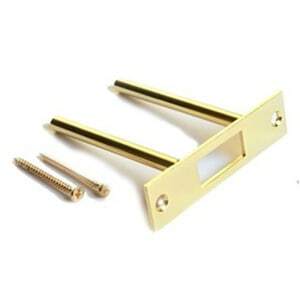 A strike plate is a metal plate affixed to a door jamb with a hole or holes for the bolt of the door. When the door is closed, the bolt extends into the hole in the strike plate, and holds the door closed. 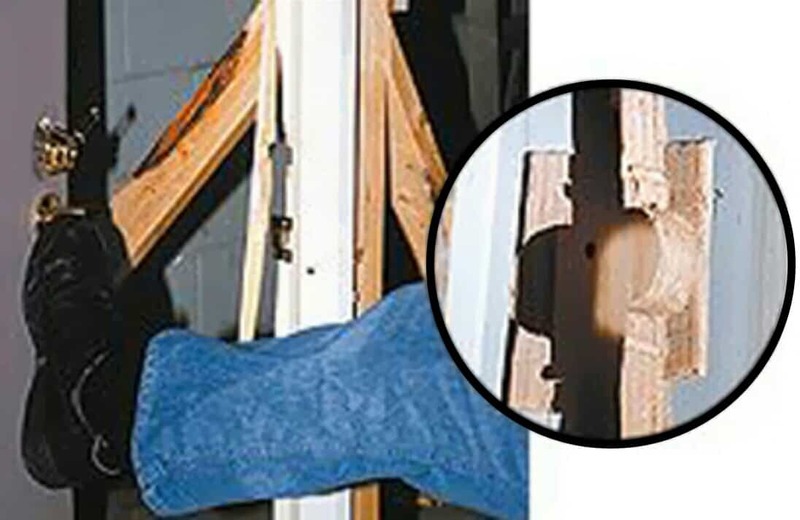 The strike plate protects the jamb against friction from the bolt, and increases security in the case of a jamb made of a softer material (such as pine) than the strike plate. This is a standard strike plate after a KICK-IN. The door jamb has split due to the force. This door had a standard strike plate and 2 inch screws. Don’t let this happen to your door! PROTECT your home and family with Medeco High Security Locks and Deadbolts and TUFF STRIKE high security strike plates! TUFF STRIKE is a Heavy Duty, High Security strike plate that is installed on your door jamb and made of hardened steel. It has two 4 inch posts that insert deep into the actual frame for superior strength and support. The Tuff Strike also is fastened by 3 inch screws and replaces the existing strike plate. Call us today for installation on most doors!